Every year, we send out a huge stack Christmas cards. It's one of my favorite Christmas traditions, especially since we get to show off our little boy each year! Gather inspiration. Look at other card designs. It's fun to see what pro designers have put out there. 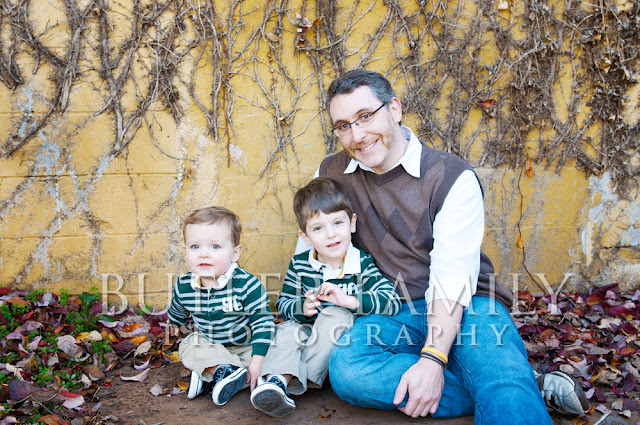 You can get a lot of great ideas from these sites: http://www.minted.com/ and http://www.tinyprints.com/. 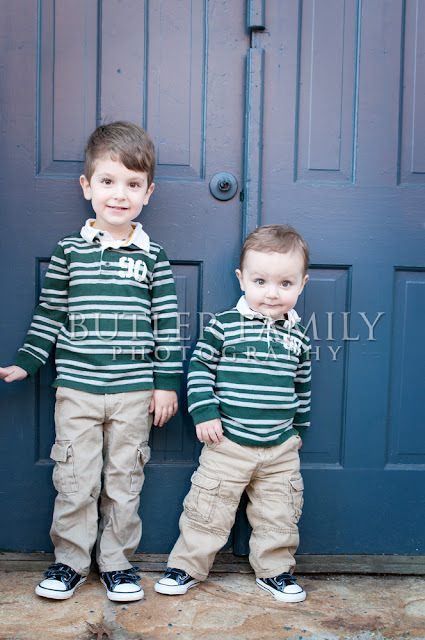 If you decide to go the tripod and timer route, don't expect more than one or two photos to turn out. 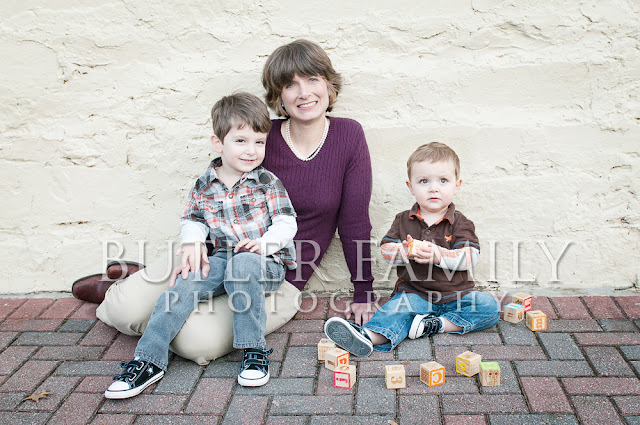 Self-timer pictures can be done, but they take a long time, and kids tend to fade quickly with the tripod. From my experience, it is totally worth it to get a photographer to take your pictures. Pick one to two of your favorite images to put on the card. I've seen cards with so many pictures, I can't tell which is the most important. A good rule of thumb is to keep one image dominant by making sure it is at least 3 times bigger than the other elements on the card. 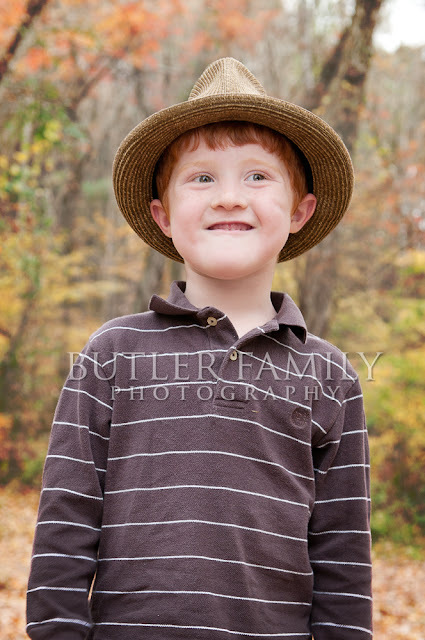 Of course, this rule may be broken if you are doing a series of pictures of the same size -- often in odd numbers. In that case, the set of images itself acts as the dominant element. Keep text and fonts to a minimum. I really think the photo (or photos) should be the most important part of the card--after all, that's why you are sending it--people want to see you. As for fonts, I rarely use more than two font types in a design. If I'm using a fancy font for one piece of text, I'll use a plain one for the other. Good design needs contrast. If you have too many elements competing with each other, then the design is weak. Get help designing if you need it. I design my card in Photoshop. But you don't have to have a professional design program to make a great card. If you are having your Christmas cards printed online, see if your vendor has an online design program. If you want to do something totally unique, contact me for custom designs or get help with an online/phone mentoring session. Proofread! It's embarrassing to have misspellings or grammar mistakes in your card. Make sure to print up a sample and proofread. Better yet, have someone else look over the card. I hate to admit it, I've seen a few mistakes on Christmas cards I've received this year. Whoops! Have the cards printed at a reputable printer. We print our cards at http://www.overnightprints.com/. They offer great prices and are professional printers that color manage. If you get cards at a discount printer that does not color manage or use professional inks and paper, you'll probably be disappointed. It's not fun sending out a ton of cards that don't look right. Save one or two for yourself! 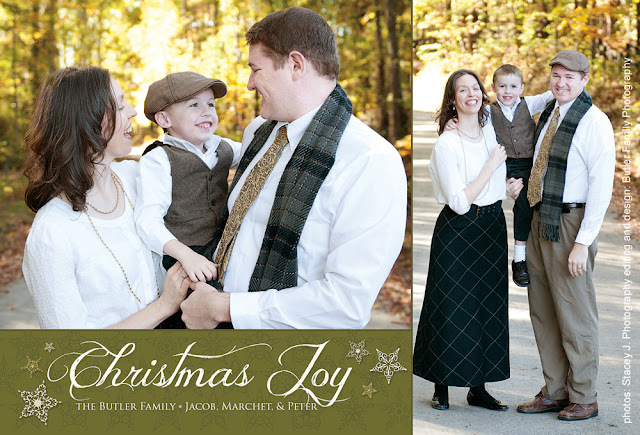 Your yearly Christmas card is a great piece of family history that you'll want to look back on every once and a while. I keep our old Christmas cards with our decorations so I can look at them every year. It's fun to see how our family has changed. The workshop giveaway winner is: Molly! 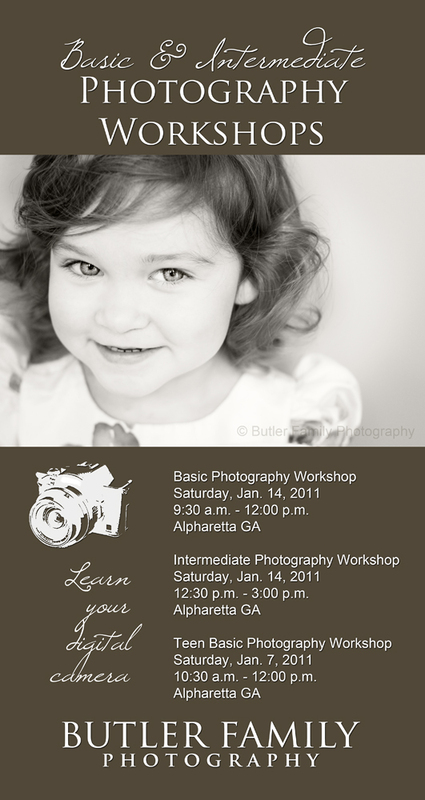 Please contact me within 48 hours to claim your spot in one of my January 2012 Workshops. Thank you to all who participated! If you didn't win, but entered the giveaway, you can get a $5.00 discount if you sign up for one of the workshops before Christmas 2011. UPDATE: The giveaway is now closed. I'll announce the winner by noon on Thursday. In honor of completing my Christmas shopping (well, almost), I'm doing a giveaway! Here's a chance to win a spot (for you or for a friend) in one of my upcoming workshops this January. 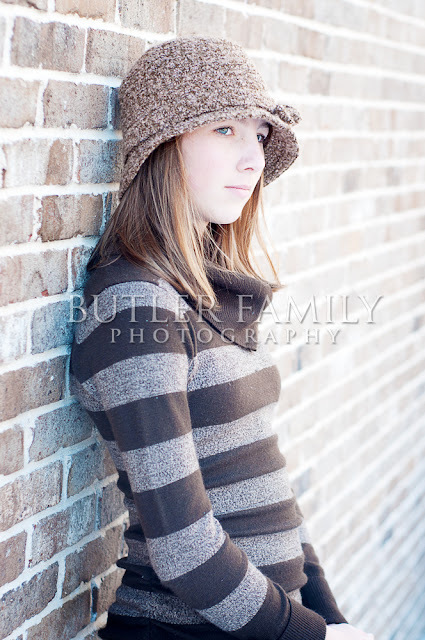 I will be giving away one free admission to either the Basic Photography Workshop, the Intermediate Photography Workshop, or the Teen Basic Photography workshop in Alpharetta, GA. 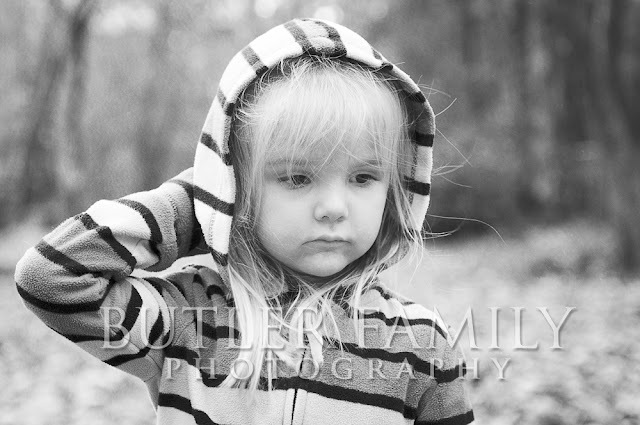 They are all hands-on, fun, and informative classes that will take your photography to the next level. Click here to read more about the workshops. Like Butler Family Photography on Facebook, and/or follow @marchetbutler on Twitter. Then, . . .
Post about this giveaway on Facebook, and/or Tweet about it on Twitter. (Use the Tweet and FB Share buttons above.) Finally, . . .
Post a comment below saying you entered the contest. Also, let me know which workshop (the Basic, Intermediate, or Teen) you would prefer. Yes, you can win for a friend! You have until midnight (Eastern time) on Wednesday, December 21st to enter the contest. Only one entry per person allowed. One winner will be chosen randomly from the comments section below. The winner will be announced the following day. The winner must contact me within 48 hours or the workshop admission will be awarded to another giveaway participant. Butler Family Photography has no association with any social media sites (such as Facebook, Twitter, etc.). 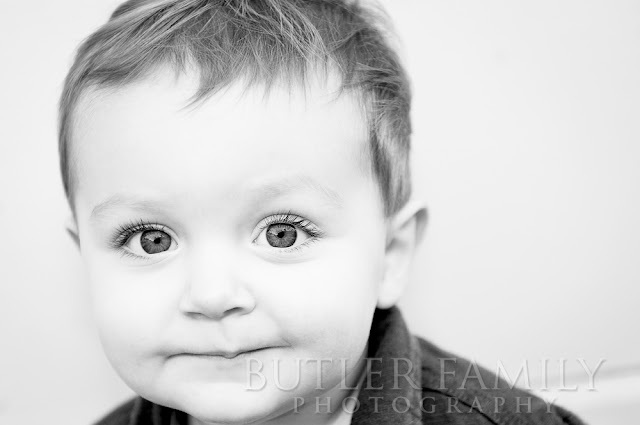 Butler Family Photography reserves the right to remove entries due to irrelevant or inappropriate content. 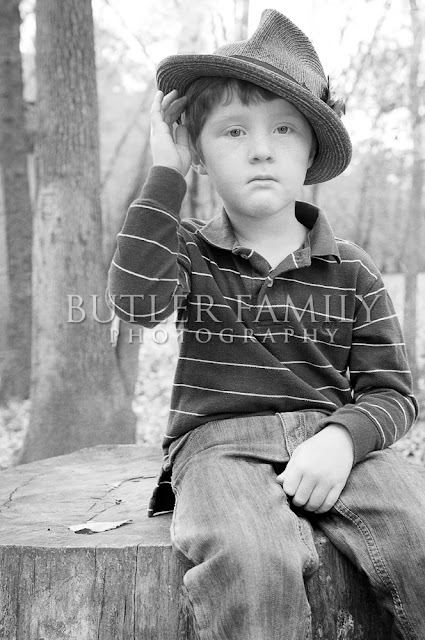 As often as I can, I get out and take photos of my little guy and (as in this case) his friends that happen to be with us that day. I always love new faces to photograph, but in this case I had to work fast. 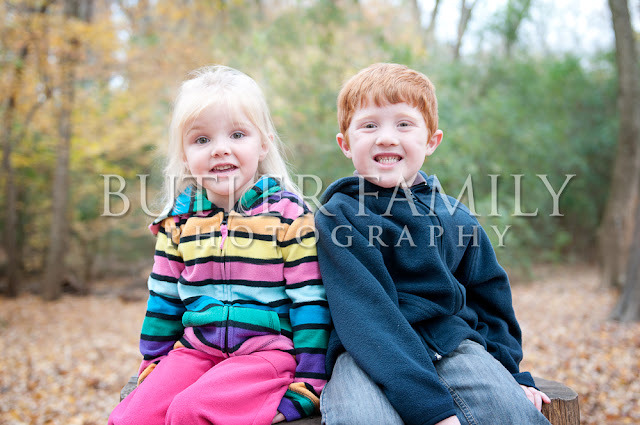 Big brother wasn't as into taking pictures (2 minutes and he was done), but his little sister took my breath away. 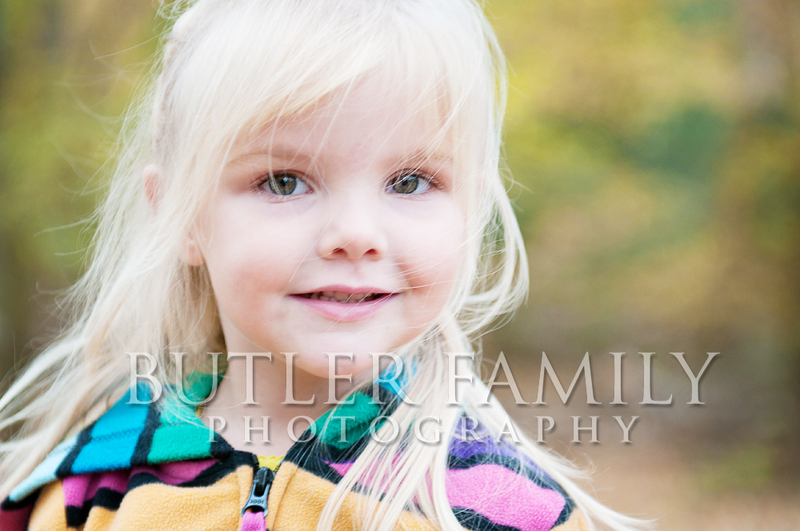 Seriously, I only took pictures of her for about 10 minutes, and look how gorgeous! 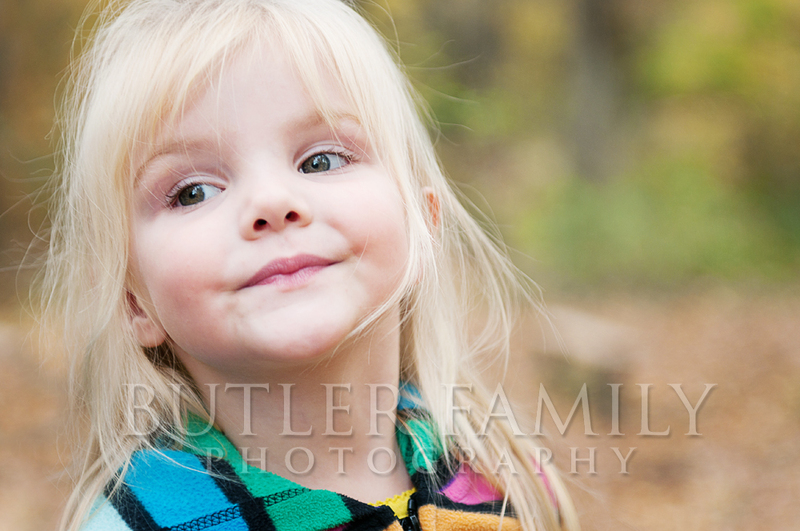 Love these portraits? Want to learn how I do what I do? 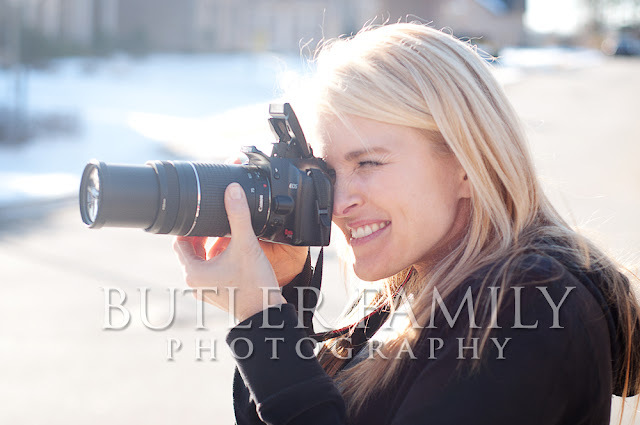 I'm holding photography workshops in January for beginning and intermediate photographers. I even have a special workshop for teens. I still have several spots open, but hurry! I'm limiting enrollment to 6 per class. Click here to find out more. Lately, I've been using props in my shoots, especially with children. 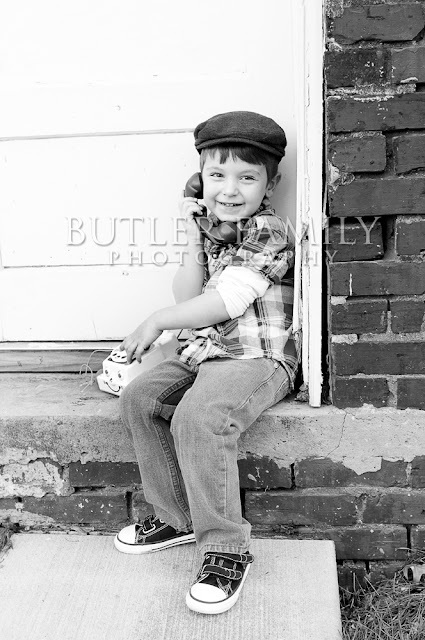 Something new like a hat (or hats Dad brought), blocks, or vintage telephone toy captures their interest and helps keep the smiles going through a whole shoot. 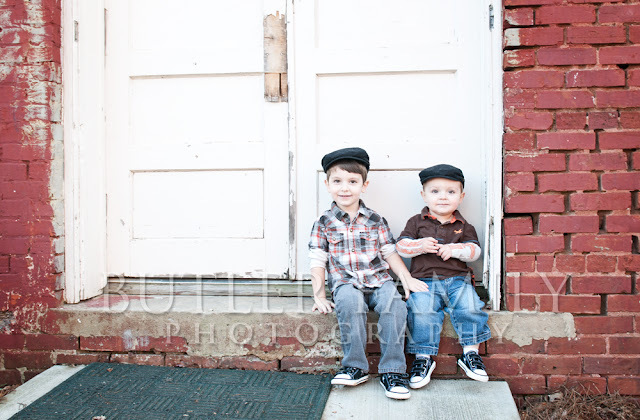 Since these boys' parents especially wanted portraits of the boys together and alone, I stuffed my photo bag full of props and used them all through the portrait session. I think we got some amazing shots!